Difficult to adequately describe this card with words. 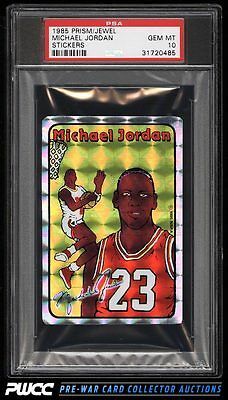 The '85 Prizm Sticker production remains one of the more fragile and yet production unique collector cards ever created, leveraging hologram print technology that didn't get replicated by other manufacturers until the 1990s. A very fragile foil design which is highly susceptible to edge chipping and related wear, not to mention the highly reflective surface which easier marrs and scratches from even light handling. Offered here is the one and only PSA 10 ever awarded in the history of PSA grading; the single finest Jordan example available. This exact card has traded privately in the past for $50,000. We are proud to offer this amazing investment piece to the collecting community, free of reserve or other restriction. A special card, worthy of the finest collection. One of nearly 20,000 cards, lots, and sets up for bid in our 7th Auction of 2016. Click on the link above to view the other PWCC auction lots.